That reminded me of some people, and one in particular about whom I had written many years ago. Please allow me to share it again, duly updated and edited. Some years ago, I got reacquainted with an old contact. We had met briefly on social occasions like marriages and had thought that we had a lot in common – having exhaustive conversations and exchanging mails. That had been more than a decade ago. She was in the corporate world. I was writing for publications and had got a book published; the L&M held a senior position in a multinational. All was well with the world as she must have deemed us to be ‘on par,’ socially. Then she moved, we moved and we lost touch. The L&M quit the hallowed corporate world, I had stopped writing for various reasons and our lifestyle had generally shifted gears. I had moved in other ways too. And then we met again. And I realised the inevitable truth with the first exchange of greetings. Over the evening, it took all my elite-class qualities not to punch her on the nose! I commend the middle class highly. It is the one solid class that makes the wheels of the country go round. It is the invisible workforce, in the lower and middle echelons of the corporate and bureaucratic world and one that keeps things going smoothly, not the Sheila Dixits and Sonia Gandhis or even the page 3 celebrities who ‘patronize’ the arts. The yuppies and the puppies follow a class system all their own which is measured by the length and breadth of the car they own, the glitter and glitz of their ‘kothis’ (houses) – that have more marble than can be found in Makrana and more glass than Belgium – and the foreign holidays they go on. But this lady was not one of the Yuppies or Puppies. She was a class apart. She was a ‘culture vulture,’ no less! Note: Those living in other metros than Delhi may please substitute the localities with the pertinent ones in theirs. “I only shop in the State Emporia or at the Cottage! (Cottage Emporium). I hate those cheap stuff sold at the markets (Sarojini Nagar and Lajpat Nagar). I only wear class stuff!” – spat out as she delicately adjusted her dupatta. Frankly, I could see nothing classy about her salwar suit, which I could have bought in Sarojini Nagar for at a throwaway price. I suppressed a smile. I had forgotten that being upper class snobs also makes them rude, as they consider themselves above such civilities. Suddenly she changed tack and gushed: “I love theatre! In our family, we all are into the fine arts and don’t miss any opportunity to attend a concert or play.” (Of course she failed to mention that this was subject to a free pass to the said shows!) The art patron, no less; wow! If you follow Baba Ramdev to do yoga and pranayam you are plebeian and crass. (I am sure she would have added another adjective – Hindu fundamentalist if I were to meet her now!) But if you join some funky yoga and meditation camp at a resort – preferably run by a foreigner – and pay an arm and a leg for it, you have class! If you rave about an upcoming musician who performed in the community hall of your housing society, you are oh-so-middle-class, never mind if his music is divine and class. But if you go to a concert in the India International Centre to listen to a rookie whose only claim to fame is a rich and powerful father, you are oh-so-with-it. And oh, the culture vultures also ‘appreciate’ and ‘enjoy’ folk music, provided of course the performance is in an air-conditioned auditorium, if you please! Get my drift? She pulled a long face. “It was terrible in the beginning. Now I have got used to it. We have only lived in the best places – Green Park, Shanti Niketan…You know, neighbourhoods where corporate classes live.” I tut-tutted sympathetically while resisting the urge to tell her that the neighbourhoods she proudly listed have an equal number of traders and businessmen, but perhaps by corporate, she meant those loaded with moolah and, money as we all know is a great leveler. Who was I to argue with her logic? When we parted, I could almost hear her audible sigh of relief for having been delivered from the company of a middle class ignoramus of fine arts and what ever not. As for me, her dissertation on the middle-class and its drawbacks was coming out of my ears and was I glad to escape! Now, I have no qualms about saying that I belong to the middle class – middle middle class if you please — corporate spouse or no. And I will enjoy the music of Pandit Bhimsen Joshi and M.S. Subbulakshmi as much as the music of a Bollywood blockbuster ; would happily shop in Lajpat Nagar or the Cottage Emporium as the moods seizes me. And above all, I refuse to give these culture vultures the right to look down their snooty noses at this solid mass of upright citizens called the ‘middle class’. So there! To me class constitutes what you are from within, your civility, your graciousness, your willingness to give of yourself and your possessions, your integrity, your ability to interact with everyone without being condescending or ingratiating regardless of the person’s social standing. Nowhere in this definition come I what you do for a living, how much you have or where you live. By this definition, the poorest rickshaw puller living in the slums or a housemaid can belong to the elite class. Conversely too, the supposedly upper class persons can belong to the other extreme of the social spectrum due to the absence of these qualities. I am of course aspiring to graduate to the upper class in the true sense of the word and will continue to do so till I succeed. After all life is all about ascending to a higher plane, and becoming a better person, isn’t it? Oh…how did I miss this? me thinking…what class do I belong? 😛 what do you think? 😉 but seriously, how ever rich you become, how can one forget where he has come from? Even if you want to forget it also, a piece from your past keeps popping up on the surface quite often. Hmmm…why others? I have seen my own maasi…turn from middle class to elite class. sigh!!! Unfortunately Latha, when people think they have turned ‘elite’ they are merely snobbish. I think your post about those scorning desis belong to the same category in a different sense, right? We usually gloss over things that upset us. I have tried to cloak it in a bit of humour. Thanks for the words of appreciation, Preethi! I’ve been grinning from the word go! ‘Culture Vulture’… oh what a delicious term. I know plenty of those too. The only reason I’m still sane is because I met most of them online. That category is easier to avoid than the ‘in the flesh’ kind. Thank God for small mercies! I happily belong to the middle class too. And I think it criminal to pay 2000 for something I can buy for 500. Why should I? I never have a moment’s hesitation in asking them to pack any left over food when we eat out. I paid for the food didn’t I? Why should I let it be thrown? I have a major thing against wasting anything… specially food. Someone should tell the ‘culture vultures’ that they overrate their own opinion. Their listener couldn’t give a fig leaf for them. If it were not for the middle class, the snooty types would be ruling the world, right? The funny thing is, designer labels are highly coveted by these beings and so they happily shell out the dough for something that can be bought at even quarter the price in the local market, sans the label. Incidentally her suit was of this variety 🙂 I think your city has its fair share of these culture vultures and I remember running away from them right in the beginning. Unfortunately for me I have met more of the real life ones. Ah! You’ve described the very sort of people that I’m forced to interact with on almost a daily basis (due to circumstances beyond my control!). Perhaps the ‘cultural’ and ‘financial’ elements are linked? Ok, I’m overthining now. PS. The OZ series. One of my all time faves. Esp the lesser known ones. Oh Sid! I do pity you for being a victim of circumstances beyond your control 🙂 These types can be great pains of the worst kind. You certainly are not overthinking. I have mentioned the woman equating the two – going as far as to attribute refinement to moolah – ugh! This is right on the dot, Zephyr! Such ‘fake’ culture-vulture type characters are so easy to identify, aren’t they? 🙂 I like what you said about being equally comfortable shopping at Cottage or Sarojini Nagar. 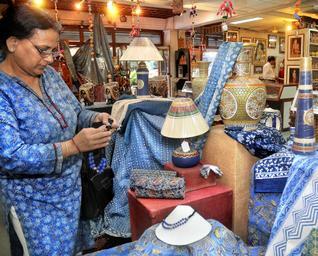 In fact, Cottage is really a good place to browse and then find almost comparable stuff elsewhere at much lower prices! That’s middle class ingenuity and cleverness at work, I think. Don’t you?! And I liked Rachna’s reference to such types speaking tooti-phooti Hindi 🙂 Such a give-away. I have seen many of these types in Delhi. That’s one other reason why I feel that city becoming more fake with every passing day. Oh yes, they stick out like sore thumbs from the furthest distance! And what is wrong if you are thrifty and get something cheap instead of shelling out a fortune for the same thing? Cottage has some good stuff but you should be careful about what you want to buy. I still have a bracelet I had bought there over 25 years ago and the polish is intact and can easily pass off for real gold! I had paid a lot at that time for that as one of my colleagues had recommended the costume jewellery there. But that was the first and last purchase I made there. And yes, I loved to browse there when I had some time on hand. Not just Delhi, but every metro and even smaller cities have their fair share of such snobs who speak Indian languages with a foreign accent and the way they look at and refer to the ‘locals’. You are right in that the Capital is fast turning into a fake and now into a nautanki capital too! A very typical person. I encountered many such kinds growing up in South Bombay. Many of them spoke in tooti phooti Hindi to feel elite. Money is what gets you respect; true class comes from God upbringing and from an enlightened mindset. It is truly distasteful how some people react and behave. Oh the tooti phooti accent is not limited to just Hindi, but all Indian languages! Which is why we laugh at our PM for his Gujarati accent while speaking English but applaud SG when she lisps in her Italian accent! You have echoed my thoughts…only in a much better way. I can identify with what u are saying. Having money does not promise culture. Some of these women just dont get it…Delhi and Gurgaon are loaded with such females. That is high praise from someone who writes so well! You know just like money does not mean culture, sometimes education just means ‘literacy’ and not education in the complete sense. Oh that one. It will be some time now. It is a govt. publication, see? hmmm… there seems to be no way to eliminate these kinda people from OUR society 😉 but guess we’ll have to put up with them. 😀 you are so right. And hey, which book is this you are talking about?? It amazes me that people can speak that way and not feel stupid…good lord!!!! People can be such social snobs and highbrow but when they talk like that, they are only betraying their insecurity. And oh, the book! It was for children about the childhood incidents of great achievers of our country written in the form of stories. It is translated into 5 languages and I am working on the sequel. That was a really interesting take on snobs. But alas! what I have come to realise is, money has tremendous power, more than a host of other ‘values’. If you look at those spiteful relatives, most of them would go out of their way to talk to the richer sister and talk contemptuously to the poorer. Any restaurant will fawn over the more well dressed person who looks like he has more money and deride the ill dressed poor man who has decided to treat himself with hard earned honest money. People treat their building watch-men, newspaper boys, sweepers with such contempt and repugnance the main reason being the fact that they are poor which is so unfortunate because these people are working just as hard to make a living. It is little wonder that the ‘rich’ love themselves so much that they forget that they will gain more good wishes if they maintain that humility and respect to the others as well who in all probablity work just as hard or much harder than them but are at various stratas in society because of their circumstances. Well, I had thought I ld write a blog on this! but well, the comment is done now! And yes, there is no dignity of labour here. We only respect those who have oodles of money to call the shots and the minions to scurry to do their bidding. Go ahead and do another post on this. There is reams more to write on them! Actually I have not added anything new to your post. Are you aware that my quote came from you own post. From my understanding you were reacting to the upper class snob in India,on the basis of your own experience. When you defined what constitute class, in that definition, I thought, you were trying to make your readers realise that snob value does not take one anywhere, but what matters are human values. And I added my signature beneath it to show my support to your point of view. And now you say,never mind, ”such things are all over”:). So I wonder what was your post message? If my understanding is wrong correct me. And yes, i would still love to hear about your experiences. Do send me a link when you post it! Well, as I come from the land that invented snobbery, I can tell you I hate it. ”It is what you are from within, your civility, your graciousness, your willingness to give of yourself and your possessions, your integrity, your ability to interact with everyone without being condescending or ingratiating regardless of the person’s social standing”. If a good majority of Indians had truly understood this, that place would have been totally different. Can you really say that things are different outside India? I mean is there such an egalitarian society in SA? Such things are there all over, I believe. But maybe you have experienced differently. Would love to hear about it. The richest people I see in AP are the Govt officers…a Jr Eng owns a sedan and an 1 crore apartment! and if you hear them talk you would puke! What I consider ‘rich’ is being able to intelligently discuss any topic under the sun…and to talk about yourself and your achievements without sounding as if you are bragging…that’s rich! A hollow vessel do make lot of noises– nice write up- for the evening you must thanks her being your inspiration for the post.Have a nice day! LOL. How true! It was also a ‘learning’ experience about the classes! Apart from the latest cars , marble tiles and Belgium glasses , you forgot to add two or three puppies, a ferocious looking dog & a big sign board of “Beware of Dogs” behind a mustached security guard! errrm wen did “corporate” and “upper class” became synonymous?? the snobs can go take a hike,they don’t know what they are missing.. I love corporates like you, Rati! Clean and fun and honest. that’s why you are proud of being middle class with a capital M — you have integrity just as the vast majority of the middle class. Always looking down on those whom they consider to be inferior to themselves. They never seem to be satisfied in life, though. Most of the time apprehensive whether they are associating with the ‘right’ people or wearing the ‘right’ clothes, etc. Welcome here Manju. They are insecure, aren’t they? And being insecure they try to cover it up with some reverse snobbery. I don’t even mind the snobs who just act snooty, but I definitely take exception to those who are vocally abrasive and rude about their ‘superiority’ or rather the others’ ‘inferiority’. She sounds like a typical Delhi behenjee…deep down insecure, a shallow airbag who derives pleasure from putting others down. Mail her this article along with the comments. She deserves it. ← Children, exercise to score – in exams!